A ‘show & tell’ presentation where the primary methods are described while allowing the participants to handle the materials, tools, and prints of each technique. Discover the clues to the differences between the four basic processes - relief, intaglio, planographic, stencil printing. 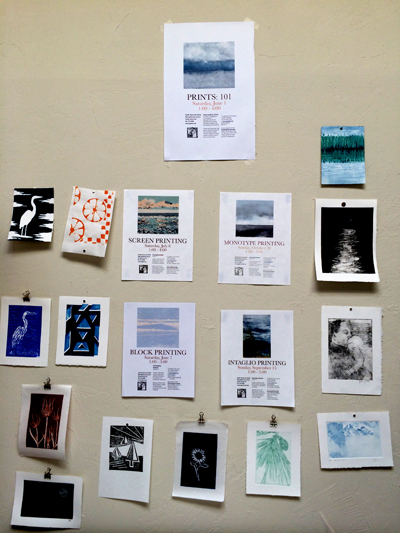 Learn about contemporary as well as traditional printmaking. The best way to learn anything is to give it a try! 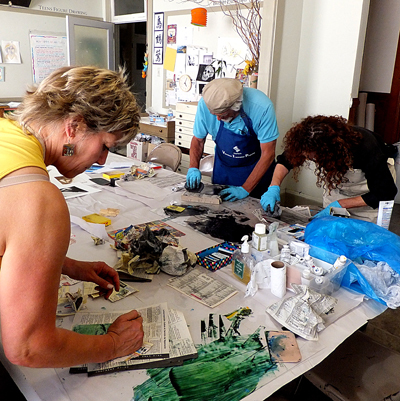 Single afternoon workshops are offered to discover the separate processes of relief (block), intaglio (drypoint), planographic (monoprint or lithograph) or screen printing. By creating a small print or greeting card the novice will learn the steps to complete an image. Materials are provided and no previous art experience necessary. All you have to bring is the curiosity and willingness to experiment!